Desalto took full advantage prominent new location, presenting with its signature understated elegance. Arik Levy dominated the new introductions with no less the four new designs: The Endless barstool, Path lounge chair, Twister low tables, and Double Me wall shelves. Marco Acerbis designed the beautiful, minimal MIR wall mirror that features a "glove compartment". The Trunk II table, part of e15's Selected collection, with its over four meter long solid European walnut top and polished, yet industrial, brass base, was this year's showstopper at e15. The new Kazimir table, the "low calorie" version of the Trunk II, is the perfect alternative for people who love the aesthetic but prefer a "less rich" aesthetic. Kazimir was shown at the fair with a straight edge and with the raw edge at the showroom in Zona Tortona . The Elbe collection of a low and high table, plus a bench, first introduced in Cologne, were shown this time in all black. The Kerman seating system was beautifully display in new textiles. Now also available additional sizes for the round ottoman. 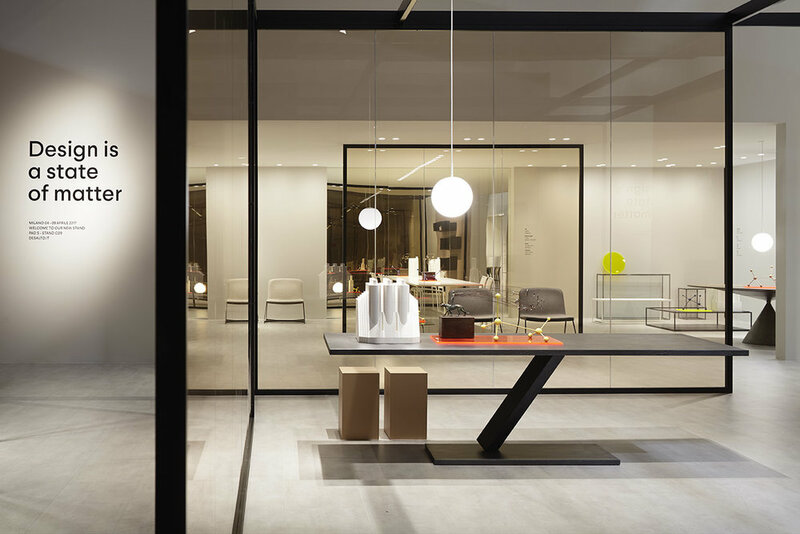 After a spectacular launch of the Jaime Hayon collection in Cologne, Wittmann continued with another breathtaking display in Milan. The entire stand was designed by Hayon and beautifully communicated the playful, yet sophisticated attitude of the collection. He added the "Hayon" Mirror, available in three sizes, and a "Hayon" dining table, surrounded with the classic Fledermaus chairs by Josef Hoffmann, shown in a new blue-green lacquer. Two designs created one hundred years apart and yet a perfect match.